Add this tongue cleaner to your routine to take your mouth to the next level of sparkly-fresh. It’s Made in the USA in a FDA registered dental facility from medical- and food-grade materials (like the ones used in baby bottles) that are free of BPA, parabens, and phthalates. Micro-groove technology maneuvers around your tongue to remove bacteria and give you fresher breath. Dimensions: Each: 0.25" x 1.13" x 6.7"
Product is easy to use and does not cut like some metal scrapers. Third-time purchase. Sense the difference if I do not use it. This is a fabulous tool to remove any bad breath! It's easy to travel with, doesn't tear at my tongue the way my metal one did, and seems to clear away more stuff. That criteria was on Maker Lori Townsend’s short, but important list of must-haves when making this new take on a tongue scraper. 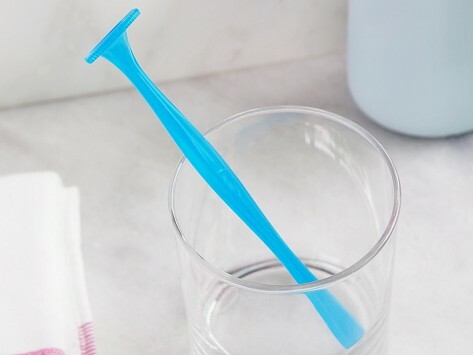 To make it work better than some others, this cleaner is designed with micro-groove technology that acts like a mini rake to de-gunk (aka remove bacteria from) your tongue. It reaches between bumps and around curves and leaves your mouth feeling sparkly clean before you even brush your teeth.